The City of Saratoga (pop. 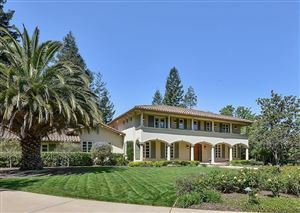 29,843) is a scenic, prestigious bedroom community in the southwestern corner of the Santa Clara Valley. Originally a community of summer cottages built in and around the fruit orchards, today Saratoga known for its excellent schools, low crime rate, tranquil lifestyle, and charming downtown district. Its neighborhoods display a variety of residential styles, including turn-of-the-century Victorians, sprawling California ranch homes, and grand estates. The historic downtown district–the “Saratoga Village” or simply “The Village”—offers distinctive restaurants, European-style bakeries, unique shops, bustling cafes, and classic architecture. Additionally, Saratoga offers vibrant entertainment, including the beautiful Mountain Winery in the Saratoga foothills where world-class concerts take place each spring and summer. Many well-known vineyards dot the Saratoga foothills, including the Garrod Estate Vineyards, founded in the 1800s. Limited available land for new development keeps Saratoga housing prices strong. In 2007, its median home price of $1.42 million ranked it 17th highest in the United States. There are approximately 10,000 households. As an affirmation of the many fine qualities of this community, in 2005, Money Magazine ranked the City of Saratoga twenty-six in its “Best Places to Live” survey.